Naval Station Norfolk occupies about 3,400 acres of Hampton Roads real estate in a peninsula known as Sewells Point. It is the world's largest Naval Station; in fact, based on supported military population, it is the largest military station in the world. 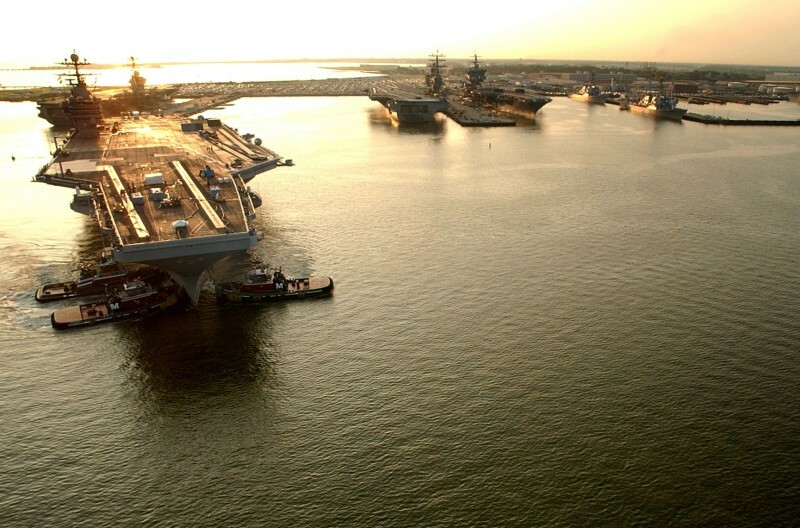 The Norfolk Naval Base (NNB) is located on 4,631 acres, directly northwest of the City of Norfolk, Virginia. The Naval Complex includes Norfolk Naval Base as well as other Naval Facilities of the Sewells Point Naval Complex. When the 78 ships and 133 aircraft home ported here are not at sea, they are alongside one of the 14 piers or inside one of the 15 aircraft hangars for repair, refit, training and to provide the ship's or squadron's crew an opportunity to be with their families. Naval Station is homeport to aircraft carriers, cruisers, destroyers, large amphibious ships, submarines, and a variety of supply and logistics ships. Port Services controls more than 3,100 ships' movements annually as they arrive and depart their berths. Port facilities extend more than four miles along the waterfront and include some seven miles of pier and wharf space. Naval Station's Nimitz Hall is a major stopping-off point for people destined for ships, aircraft squadrons, and stations overseas. Nearly 9,000 people are processed through the Transient Personnel Unit annually en route to their destinations. It is uncommon for these ships to all be in port at one time. 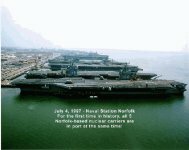 Naval Station Norfolk made history with the berthing of five (5) Nuclear Aircraft Carriers on 02 July 97 at 1730, when the Navy's newest Nimitz class carrier, USS JOHN C. STENNIS (CVN-74), returned to port, joining the USS GEORGE WASHINGTON (CVN-73), USS THEODORE ROOSEVELT (CVN-71), USS ENTERPRISE (CVN-65) and the USS DWIGHT D. EISENHOWER (CVN-69). 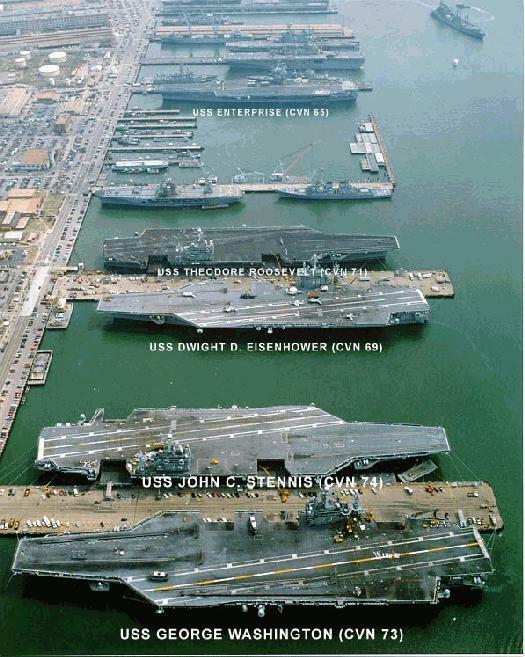 The only other time five carriers were berthed at the Naval Station was in 1992, but they were not all nuclear carriers. NAVSTA Norfolk lies on the eastern shore of Hampton Roads, immediately east of the north-south oriented Norfolk Harbor Reach. NAVSTA has 20 piers, ranging in age from 6 years (Pier 10) to 63 years (Pier 7). Eleven of the piers are 50 years old or older. During a March 1998 port visit, local harbor authorities described the pier quality at NAVSTA Norfolk as inadequate. Specific deficiencies include two piers that were in CASREP status because the deck of the piers was not thick enough for use and the fact that only two piers have good, as compared to excellent, electrical power vaults. The rest are worse. Most of the piers do not have reliable fuel service, none of the piers have dedicated fire mains, all pilings are reinforced concrete but are eroding at water level, etc., etc. Pier 2 will be demolished and replaced with an up-to-date double-deck facility, but a specific date for the work was not mentioned. Pier 11 (built 1984) was considered to be in the best condition of all NAVSTA piers, but it is more exposed to wind than many of the other piers. Berths at NAVSTA are numbered from inshore to seaward with odd numbers on the north side and even numbers on the south side. (For example, Berth 5-6 represents Pier 5/Berth 6.) Piers 2, 3 and 4 are warehouse piers and are primarily used for ships taking on stores. Piers 5, 7 and 10 are primarily for the use of surface combatants. Piers 11 and 12 are primarily for the use of aircraft carriers and large surface combatants. Piers 20 through 25 are primarily for the use of destroyer/submarine forces. The US Naval Station piers at Norfolk are located about 18 nmi west of the entrance to the Chesapeake Bay from the Atlantic Ocean. To reach the piers, vessels from the ocean must transit Thimble Shoal Channel, which crosses the southern end of the Chesapeake Bay; pass through the bridge opening at the lower end of the Chesapeake Bay Bridge-Tunnel; pass between Old Point Comfort on the north and Fort Wool on the south; transit the Entrance Reach Channel at Hampton Roads; and enter the Norfolk Harbor Reach Channel which is adjacent to the west side of the Naval Station. The channels are maintained at a minimum depth of 45 feet. Except for areas close to shore, the water is about 18 feet deep from the Atlantic Ocean to Hampton Roads. The channel boundaries are marked by numerous buoys along the route. The buoys are generally 1/4 nmi apart near turns to about 1 nmi apart along straight sections of a channel. Port Services controls more than 3,100 ships' movements annually as they arrive and depart their berths. Port facilities extend more than four miles and include some seven miles of berthing space. Naval Station's Nimitz Hall is a major stopping-off point for people destined for ships and stations overseas. Nearly 30,000 people are processed through the Transient Personnel Unit annually en route to their destinations. The Magnetic Silencing Facility maintains and operates degaussing ranges at the Sewells Point Degaussing Range and Lamberts Point Deperming Station and magnetic treatment and calibration services at Lamberts Point Deperming Station. The Station provides degaussing services, including ranging and deperming for US Navy, US Government and friendly nation ships. They also provide technical reports as required, maintain degaussing records of all US Navy ships, and provide on board technical and administrative training to both US Navy ships and friendly nation Navies. In March 1946, the Chief of Naval Operations directed the Commandant 5th Naval District, who also had been Commandant U.S. Naval Station, to include Naval Station Norfolk and Naval Air Station Norfolk as separate components under the military command of Commandant Naval Base, whose title was changed to Commander Naval Base and then to Commander, Navy Region, Mid-Atlantic. Postwar period developments underscored the capacity of the Naval Station to change. The station at first stored inactive aircraft carriers, other reserve vessels, and finally submarines and destroyers. Fire fighting and salvage control now became specialties. The Atlantic Fleet Command came ashore in 1948 and placed its headquarters with a staff of 165 officers and 315 enlisted in an abandoned hospital. At the same time, the station rendered service to military as well as scientific pursuits. Known officially as Naval Operating Base until 31 December 1952, on 1 January 1953 the name of the installation was changed to Naval Station Norfolk. Always seeking to provide the best service to its customers, the Naval Station has evolved and made necessary and/or convenient improvements such as the Navy Exchange Mall, which was opened at its present location in November 1989 and expanded again by another 189,000 sq. ft. in September 1998. Another momentous occasion in 1998 was the opening of Enterprise Hall, a new state-of-the-art bachelor housing building, centrally located in the heart of the Naval Station next to the Naval Station Galley. As part of the Navy's response to the post-Cold War drawdown of the 1990's, many new initiatives were implemented at Navy shore installations to reduce their operating cost, improve their efficiency, and better match their capacity to the reduced size of the Navy. In 1998, the Navy began a major realignment of shore command organizations and processes throughout Hampton Roads in a process known as "regionalization". One of the biggest steps and efficiencies in this process was the merger of separate Naval Station and Naval Air Station (which were directly adjacent to each other) into a single installation to be called Naval Station Norfolk. This consolidation became official on February 5, 1999. In November 2001 the piers at Naval Station Norfolk were renumbered to help eliminate some of the confusion caused by the current system. The new system will begin at the South end of the station (old pier No. 20) and will be numbered consecutively from No. 1 to No. 13. In instances where there is an existing pier (scheduled for demolition) and a new pier, the pier to be demolished will have an "alpha (A)" added after the pier number. Renumbering of the piers was scheduled in conjunction with the Nov. 19 ribbon cutting of the two new military construction piers on the naval station waterfront. Pier and directional signs will be changed over the weekend of Nov. 15-18. For people who haven't worked on this base for 20 years, the old pier numbering system was confusing. Just imagine the sailor who is here for the first time standing at pier No. 10. They can see pier No. 7 to the south and pier No. 11 to the north but they are looking for Pier 24. One would assume it is north of pier No. 11 - previously, it was not. That's because of how Naval Station Norfolk grew. The naval station is a very large old base that grew in pieces. They started out building piers and numbering them at what was then the south end of the base. However, the Navy obtained additional land to the south of these piers. If they had continued to use the numbering convention in place we would have piers with negative numbers. So, they started over again at the south end of the base, with pier No. 20. Now, with the new numbering system taking effect Nov. 15-19, the piers will be numbered in order. This will allow personnel new to naval station to find the pier they need to be at easier. In its 2005 BRAC Recommendations, DoD recommended to close Naval Submarine Base New London, CT. As a result, several of its functions and units were relocated to Norfolk. DoD recommended to relocate the base's assigned submarines, Auxiliary Repair Dock 4 (ARDM-4), and Nuclear Research Submarine 1 (NR-1) along with their dedicated personnel, equipment and support to both the Submarine Base Kings Bay, GA, and Naval Station Norfolk. It also recommended to consolidate the Naval Security Group Activity Groton, CT from New London with Naval Security Group Activity Norfolk, VA at Naval Station Norfolk, VA. Sufficient capacity and fleet dispersal would be maintained with the East Coast submarine fleet homeports of Naval Station Norfolk without affecting operational capability. Due to the relocation, an Air Conformity Determination might be required. Naval Station Norfolk was in Maintenance for Ozone (1-Hour) and Marginal Non-attainment for Ozone (8-Hour), requiring the determination. There would also be potential impacts for dredging; marine mammals, resources, or sanctuaries; threatened and endangered species; and water resources. In another recommendation, DoD recommended to realign Naval Station Newport by relocating the Navy Warfare Development Command to Naval Station Norfolk. The Navy Warfare Development Command performs the functions of warfare innovation, concept development, fleet and joint experimentation, and the synchronization and dissemination of doctrine. Relocating the Navy Warfare Development Command to Norfolk would better align the Navy's warfare development organization with those of the other joint force components and Joint Forces Command, as well as place Navy Warfare Development Command in better proximity to Fleet Forces Command and the Second Fleet Battle Lab it supports, resulting in substantial travel cost savings to conduct experimentation events. Location of Navy Warfare Development Command in Hampton Roads area would place it in proximity to the Army Training and Doctrine Command, Fort Monroe, VA and Marine Corps Combat Development Command, Quantico, VA, as well as in closer proximity to the Air Force Doctrine Center at Maxwell Air Force Base, AL, which would further joint interoperability concepts. Environmentally, there would be potential impacts for the environmental resource areas of cultural, archeological, or tribal resources and wetlands. Norfolk's attainment values are the same as in the previous recommendation. DoD also recommended to relocate Helicopter Mine Countermeasures Squadron 15 (HM-15) and dedicated personnel, equipment and support from Naval Station Corpus Christi, TX to Naval Station Norfolk and to disestablish Commander Helicopter Tactical Wing U.S. Atlantic Fleet Aviation Intermediate Maintenance Detachment Truax Field at Corpus Christi, TX and to relocate its intermediate maintenance function for Aircraft Components, Fabrication & Manufacturing, and Support Equipment to Fleet Readiness Center Mid-Atlantic Site Norfolk, VA. The relocation of Helicopter Mine Countermeasures Squadron 15 (HM-15) to Naval Station Norfolk would single site all Mine Warfare Aircraft in a fleet concentration area. This location would better support the HM-15 mission by locating them closer to the C-5 transport Air Port of Embarkation for overseas employment and mine countermeasures ship and helicopter coordinated exercises. Environmentally, Naval Station Norfolk was in Maintenance for Ozone (1-Hour) and Marginal Non-attainment for Ozone (8-Hour); no Air Conformity Determination would be required. DoD also recommended to consolidate Naval Facilities Engineering Field Division South, Charleston, SC, with Naval Facilities Engineering Field Activity Southeast at Naval Air Station Jacksonville, Naval Facilities Midwest at Naval Station Great Lakes, IL and Naval Facilities Atlantic at Naval Station Norfolk, VA. It also recommended to close Naval Facilities Engineering Field Activity Northeast leased space in Lester, PA. As a result, DoD would consolidate Naval Facilities Engineering Field Activity Northeast, Philadelphia with Naval Facilities Atlantic at Naval Station Norfolk, VA. This recommendation would enhance the Navy's long-standing initiative to accomplish common management and support on a regionalized basis by consolidating and collocating Naval Facilities commands with the installation management Region at the above sites. This relocation would also achieve savings by moving from leased space to government-owned space. Naval Facilities Engineering Command would undergo organizational transformation; this recommendation would facilitate the evolution of organizational alignment and would increase the average military value of each Engineering facility. In another recommendation, DoD recommended to realign Naval Station Newport, RI, and the Washington Navy Yard, Washington, DC, by consolidating Naval Reserve Readiness Command Northeast with Naval Reserve Readiness Command Mid-Atlantic and relocating the consolidated commands to Naval Station, Norfolk. This recommendation would enhance the Navy's long-standing initiative to accomplish common management and support on a regionalized basis, by consolidating and collocating reserve readiness commands with the installation management Regions. This collocation would also align management concepts and efficiencies and would ensure a reserve voice at each region as well as enablle future savings through consolidation of like functions. This recommendation would result in an increase in the average military value for the remaining Naval Reserve Readiness Commands and would ensure that each of the installation management Regions had an organization to manage reserve matters within the region. Environmental concerns regarding this recommendation were identical to those mentioned above. 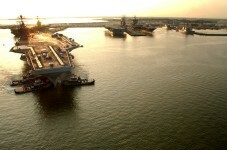 In another recommendation, DoD would realign Fort Story, VA, by relocating the installation management functions to Commander Naval Mid-Atlantic Region at Naval Station Norfolk, VA.
All installations employed military, civilian, and contractor personnel to perform common functions in support of installation facilities and personnel. All installations executed these functions using similar or near similar processes. Because these installations shared a common boundary with minimal distance between the major facilities or are in near proximity, there was significant opportunity to reduce duplication of efforts with resulting reduction of overall manpower and facilities requirements capable of generating savings, which would be realized by paring unnecessary management personnel and achieving greater efficiencies through economies of scale. Intangible savings would be expected to result from opportunities to consolidate and optimize existing and future service contract requirements. Additional opportunities for savings would also be expected to result from establishment of a single space management authority capable of generating greater overall utilization of facilities and infrastructure. Further savings would be expected to result from opportunities to reduce and correctly size both owned and contracted commercial fleets of base support vehicles and equipment consistent with the size of the combined facilities and supported populations. Regional efficiencies achieved as a result of Service regionalization of installation management would provide additional opportunities for overall savings as the designated installations are consolidated under regional management structures. The quantitative military value score validated by military judgment was the primary basis for determining which installation was designated as the receiving location. Assuming no economic recovery, this recommendation could result in a maximum potential reduction of 546 jobs (238 direct jobs and 306 indirect jobs) over the 2006-2011 period in the Virginia Beach-Norfolk-Newport News, VA-NC Metropolitan Statistical Area (less than 0.1 percent). DoD would realign Naval Station Norfolk, VA, by disestablishing storage and distribution functions for tires, packaged petroleum, oils, and lubricants, and compressed gases. This recommendation would achieve economies and efficiencies that would enhance the effectiveness of logistics support to forces as they transition to more joint and expeditionary operations. This recommendation would disestablish the wholesale supply, storage, and distribution functions for all tires; packaged petroleum, oils and lubricants; and compressed gases used by the Department of Defense, retaining only the supply contracting function for each commodity. The Department would privatize these functions and would rely on private industry for the performance of supply, storage, and distribution of these commodities. By doing so, the Department could divest itself of inventories and eliminate infrastructure and personnel associated with these functions. This recommendation would result in more responsive supply support to user organizations and would thus add to capabilities of the future force. The recommendation would provide improved support during mobilization and deployment, and the sustainment of forces when deployed worldwide. Privatization would enable the Department to take advantage of the latest technologies, expertise, and business practices, which translates to improved support to customers at less cost. It centralizes management of tires; packaged petroleum, oils, and lubricants; and compressed gases and eliminates unnecessary duplication of functions within the Department. Assuming no economic recovery, this recommendation could result in the maximum potential job reductions of 17 total jobs (7 direct and 10 indirect) in the Virginia Beach-Norfolk- Newport News, VA, Metropolitan Statistical Area over the 2006-2011 time period (less than 0.1 percent). DoD also recommended to realign Naval Station, Norfolk, VA, by disestablishing the Space Warfare Systems Center Norfolk, VA, and the Space Warfare Systems Center Charleston, SC, detachment Norfolk, VA, and assign functions to the new Space Warfare Systems Command Atlantic Naval Amphibious Base, Little Creek, VA. DoD also recommended to realign Naval Weapons Station Yorktown, VA, by relocating the Space Warfare Systems Center Charleston, SC, detachment Yorktown, VA, to Naval Station Norfolk, VA, and consolidating it into the new Space Warfare Systems Command Atlantic detachment, Naval Station Norfolk. These recommended realignments and consolidations would provide for multifunctional and multidisciplinary Centers of Excellence in Maritime C4ISR. This recommendation would also reduce the number of technical facilities engaged in Maritime Sensors, Electronic Warfare, & Electronics and Information Systems RDAT&E from twelve to five. This, in turn, would reduce overlapping infrastructure increase the efficiency of operations and support an integrated approach to RDAT&E for maritime C4ISR. Another result would also be reduced cycle time for fielding systems to the warfighter. Assuming no economic recovery, this recommendation could result in a maximum potential reduction of 211 jobs (87 direct jobs and 124 indirect jobs) over the 2006-2011 period in the Virginia Beach-Norfolk-Newport News, VA-NC, Metropolitan Statistical Area (less than 0.1 percent). Environmentally, Naval Station Norfolk was in attainment for all Criteria Pollutants. Norfolk would have potential archeological restrictions to future construction. Norfolk also discharged to impaired waterways, and groundwater and surface water contamination were reported.